Western central banks have tried to shake off the constraints of gold for a long time, which has created enormous difficulties for them. They have generally succeeded in managing opinion in the developed nations but been demonstrably unsuccessful in the lesser-developed world, particularly in Asia. It is the growing wealth earned by these nations that has fuelled demand for gold since the late 1960s. 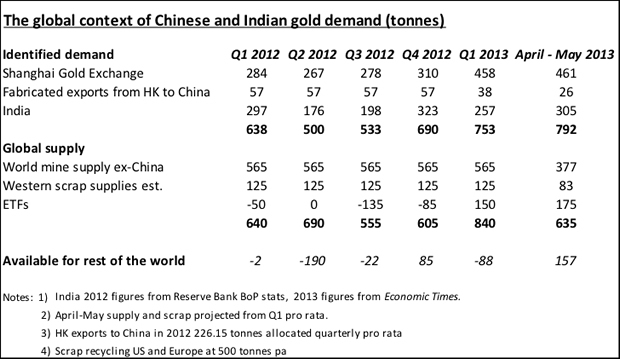 There is precious little bullion left in the West today to supply rapidly increasing Asian demand. It is important to understand how little there is and the dangers this poses for financial stability. An examination of the facts shows that central banks have been on the back foot with respect to Asian gold demand since the emergence of the petrodollar. In the late 1960s, demand for oil began to expand rapidly, with oil pegged at $1.80 per barrel. By 1971, the average price had increased to $2.24, and there is little doubt that the appetite for gold from Middle-Eastern oil exporters was growing. It should have been clear to President Nixon’s advisers in 1971 that this was a developing problem when he decided to halt the run on the United States' gold reserves by suspending the last vestiges of gold convertibility. After all, the new arrangement was: America issued the petrodollars to pay for the oil, which were then recycled to Latin America and other countries in the West’s sphere of influence through the American banks. The Arabs knew exactly what was happening; gold was simply their escape route from this dodgy deal. Because Arabs did not understand bonds and stocks they invested their surplus funds in either real estate and/or gold. Since Biblical times, gold has been the best means to keep wealth and to transfer it from generation to generation. Gold therefore was the ideal vehicle for them. Furthermore after their oil reserves are exhausted in the distant future, they would still own gold. And gold, contrary to oil, could never be wasted. According to Lips, Swiss private bankers, to whom many of the newly-enriched Arabs turned, recommended that a minimum of 10% and even as much as 40% should be held in gold bullion. This advice was wholly in tune with Arab thinking, creating extra demand for America’s gold reserves, some of which were auctioned off in the following years. Furthermore, Arab investors were unlikely to have been deterred by high dollar interest rates in the early eighties, because high interest rates simply compounded their rapidly-growing exposure to dollars. Using numbers from BP’s Statistical Review and contemporary U.S. Treasury 10-year bond yields to gauge dollar returns, we can estimate gross Arab petrodollar income, including interest from 1965 to 2000, to total about $4.5 trillion. Taking average annual gold prices over that period, ten percent of this would equate to about 50,500 tonnes, which compares with total mine production during those years of 62,750 tonnes, over 90% of which went into jewellery. This is not to say that 50,000 tonnes were bought by the Arabs; it could only be partly accommodated even if the central banks supplied them gold in very large quantities, of which there is some evidence that they did. Instead, it is to ram the point home that the Arabs, awash with printed-for-export petrodollars, had good reason to buy all available gold. And importantly, it also gives substance to Frank Veneroso’s conclusion in 2002 that official intervention – i.e., undeclared sales of significant quantities of government-owned gold – was effectively being used to manage the price in the face of persistent demand for physical gold as late as the 1990s. Arabs trying to invest a portion of their petrodollars would have left very little investment gold for the advanced economies. As it happened, U.S. citizens had been banned from holding bullion until 1974, and British citizens were banned until 1971. Instead, they invested mainly in mining shares and Krugerrands, continuing this tradition by using derivatives and unbacked unallocated accounts with bullion banks in preference to bullion itself. This meant that, until the mid-seventies, investment in physical gold in the West was minimal, almost all gold being held in illiquid jewellery form. Western bullion investors were restricted to mainly Germans, French, and Italians, mostly through Swiss banks. The 1970s bull market was therefore an Arab affair, and they continued to absorb gold through the subsequent bear market. By the late-nineties, a new generation of Swiss investment managers, schooled in modern portfolio theory and less keen on gold, persuaded many of their European clients to reduce and even eliminate bullion holdings. At the same time, a younger generation of Western-educated Arabs began to replace more conservative patriarchs, so it is reasonable to assume that Arab demand for gold waned somewhat, as infrastructure spending and investment in equity markets began to provide portfolio diversification. This was therefore a period of transition for bullion, driven by declining Western investment sentiment and changing social structures in the Arab world. It also marked the beginning of accelerating demand in emerging economies, notably India, but also in other countries such as Turkey and those in Southeast Asia, which were rapidly industrialising. In 1990, the Indian Government freed up the gold market by abolishing the Gold Control Act of 1968, paving the way for Indians to become the largest officially-recognised importers of gold until overtaken by China last year. Lower prices in the 1990s stimulated demand for jewellery in the advanced economies, with Italy becoming the largest European manufacturing centre. At the same time, gold leasing by central banks increased substantially, as bullion banks exploited the differential between gold lease rates and the yield on short-term government debt. This leased gold satisfied jewellery demand as well continuing Asian demand for gold bars. So, despite the fall in prices between 1997-2000, all supply was absorbed into firm hands. When gold prices bottomed out, Western central banks almost certainly had less gold than publicly stated, the result of managing the price until 1985, and through leasing thereafter. This was the background to the London Bullion Market Association, which was founded in 1987. In 1987, the unallocated account system became formalized under London Bullion Market Association (LBMA) rules, allowing the bullion banks to issue gold IOUs to their customers, making efficient use of the bullion available. The ability to expand customer business in the gold market without having to acquire physical bullion is the chief characteristic of the LBMA to this day. Futures markets in the U.S. also expanded, and so derivatives and unallocated accounts became central to Western investment in gold. Today the only significant bullion held by Western investors is likely to be a small European residual plus exchange-traded fund (ETF) holdings. In total (including ETFs), this probably amounts to no more than a few thousand tonnes. The LBMA was established in 1987 in the wake of the Financial Services Act in 1986. Prior to that date, the twice-daily gold fix had become the standard pricing mechanism for international dealers, whose ranks grew on the back of the 1970s bull market. This meant that international banks established their bullion dealing activities in London in preference to Zurich, which was the investment centre for physical bullion. The establishment of the LBMA was the formalization of an existing gold market based on the 400-ounce "good delivery" standard and the operation of both allocated and unallocated accounts. During the twenty-year bear market, attitudes to gold diverged, with capital markets increasingly taking the view that the inflation dragon had been slain and gold’s bull market with it. At the same time, Asian demand – initially from the Arab oil exporters but increasingly from other nations led by Turkey, India, and Iran – ensured that there were buyers for all the physical gold available. Mine supply, which benefited from the introduction of heap-leaching techniques, had increased from 1,314 tonnes in 1980 to 2,137 tonnes in 1990 and 2,625 tonnes by 2000. Together with scrap supply, London was in a strong position to intermediate between a substantial increase in gold flows to Asian buyers, and it was from this that central bank leasing naturally developed. Gold backed by these physical flows was the ideal asset for the carry trade. A bullion bank would lease gold from a central bank, sell the gold, and invest the proceeds in short-term government debt. It was profitable for the bullion bank, governments were happy to have the finance, and the lessor was happy to see an idle asset work up some extra income. However, leasing only works so long as the bullion bank can hedge by accessing future supply so that the lease can eventually be terminated. Before 2000, this was a growing activity, fuelled further by Swiss portfolio disinvestment in the late 1990s. As is usual in markets with a long-term behavioral trend, competition for this business extended the risks beyond being dangerous. This culminated in a crisis in September 1999, when a 30% jump in the price threatened to bankrupt some of the bullion banks who were in the habit of running short positions. Total above-ground gold stocks were about 129,000 tonnes, of which 31,800 tonnes were officially monetary gold. Of the balance, approximately 85-90% was turned into jewellery or other wrought forms, leaving only 10-15,000 tonnes invested in bar and coins and allocated for industrial use. Out of a maximum of 15,000 tonnes, coins (mostly Krugerrands) accounted for about 1,500 tonnes and other uses (non-recovered industrial and dental), say, 1,000 tonnes. This leaves a maximum of 12,500 tonnes and possibly as little as 7,500 tonnes of investment gold worldwide at that time. After Swiss fund managers disposed of most of the bullion held in portfolios for their clients in the late 1990s, there was very little investment gold left in European and American ownership. Frank Veneroso in 2002 concluded, after diligent research, that central banks had by then supplied between 10-15,000 tonnes of monetary gold into the market. Much of this would have gone into jewellery, particularly in Asia, but some would have gone to the Middle East. This explains how extra investment gold may have been supplied to satisfy Middle Eastern demand. Middle Eastern countries must have been the largest holders of non-monetary gold in bar form at this time. We can see that 10% of petrodollars invested in gold would have totalled over 50,000 tonnes, yet there can only have been between 7,500-12,500 tonnes available in bar form for all investor categories world-wide. This may have been increased somewhat by the addition of monetary gold leased by central banks and acquired through the market. It was at this point that the second gold bull market commenced against a background of very little liquidity. Investment bullion was tightly held, the central banks were badly short of their declared holdings of monetary gold, and from about 2004 onwards, ETFs were to grow to over 1,500 tonnes. Asian demand continued to grow (led by India), and China began actively promoting private ownership of gold at about the same time. Other than through physically-backed ETFs, Western investors were encouraged to satisfy their demand for bullion through derivatives and unallocated accounts at the bullion banks. There are no publicly available records detailing the extent of these unallocated accounts, but the point is that Western demand has not resulted in increased holdings of bullion except through securitised ETFs. Instead, the liabilities faced by the bullion banks on uncovered accounts will have increased to accommodate growth in demand. Therefore, the vested interests of the bullion banks and the central banks overseeing the gold market call for continued suppression of the gold price, so as to avoid a repeat of the crisis faced in September 1999 when the price increased by 30% in only two weeks. When the price rose to $1900 in September 2011, there was a concerted attempt to suppress the price from further rises. The lesson from the 1999 crisis is that the bullion banks’ geared exposure to unallocated accounts was forcing a crisis upon them; if they had been forced to cash-settle these accounts, the gold price would almost certainly have risen further, risking a widespread monetary crisis. Through 2012, Asian demand, particularly from China, coinciding with continued investor demand for ETFs, was already proving impossible to contain. In February this year, the Cyprus bail-in banking crisis warned depositors in the Eurozone that all bank deposits over the insured limit risked being confiscated in the event of a wider Eurozone banking crisis. This drove many unallocated account holders to seek delivery of physical gold from their banks, forcing ABN-AMRO and Rabobank to suspend all gold deliveries from their unallocated accounts. This was followed by a concerted central- and bullion-bank bear raid on the market in early April, driving the price down to trigger stop-loss sales in derivative markets and subsequent liquidation of ETF holdings. These figures do not include Chinese and Indian purchases of gold in foreign markets and stored abroad, typically carried out by the rich and very rich. Nor do they include foreign purchases by the Chinese Government and its agencies. Despite these omissions, in 2012, recorded demand from these two countries left the world in a supply deficit of 131 tonnes. Furthermore, ahead of the April smash-down in the first quarter of this year, the deficit had jumped to 88 tons, or an annualised rate of 352 tonnes. Demands for delivery by panicking Europeans in the wake of the Cyprus fiasco could only provoke one reaction. On Friday 12th April, 400 tonnes of paper gold were dumped on the market in two orders, triggering stop-loss sales and turning market sentiment bearish in the extreme. Western investors started to think about cutting their losses, and they sold down ETF holdings to the tune of 325 tonnes in 2013 by the end of May. However, this triggered record demand among those who looked on gold as insurance against currency and systemic risks. Later that year, in July, Ben Bernanke told the Senate Banking Committee he didn’t understand gold. That was probably a reference to the April gold price smash orchestrated by the central banks and how it unleashed record levels of demand. It was an admission that he thought everyone would follow the new trend by acting like portfolio investors, forgetting that if you lower the price of a commodity, you merely unleash demand. It was also an important admission of policy failure. Since those events in April, someone has been supplying the market with significant quantities of gold to keep the price down. We know it is not Arab gold, because I have discovered through interviewing a director of a major Swiss refiner that Arab gold is being recast from LBMA specification bars into one-kilo .9999 bars, which has become the new Asian standard. Arab gold does not appear to be being sold, only recast, and anyway, it is only a small part of their overall wealth. We also know from our long-term analysis that any European gold bullion is relatively small in quantity and tightly held. There can only be one source for this gold, and that is the central banks. Bearing in mind Veneroso’s conclusion in 2002 that there must be 10,000-15,000 tonnes out on lease and loan from the central banks at that time, one could imagine that this figure has increased significantly. Officially, the signatories of the Central Bank Gold Agreement, plus the U.S. and U.K. own 20,393 tonnes. A number of other central banks are likely to have been persuaded to “invest” their gold, but this is bound to exclude Russia, China, the Central Asian states, Iran, and Venezuela. Taking these holders out (amounting to about 3,000 tonnes) leaves a balance of 8,401 tonnes for all the rest. If we further assume that half of that has been deposited in London, New York, or Zurich and leased out, that means the total gold leased and available for leasing since 2002 is about 12,000 tonnes. And once that has gone, there is no monetary gold left for the purpose of price suppression. Could this have disappeared since 2002 at an average rate of 1,000 tonnes per annum? Quite possibly, in which case, the central banks are very close to losing all control over the gold price. In Part II: The Very Real Danger of a Failure in the Gold Market, I discuss why the Chinese are buying so much gold and why the Reserve Bank of India is trying to suppress gold demand. I show that gold is substantially undervalued and why that undervaluation is likely to correct itself spectacularly, precipitating a financial crisis. As can be seen form my chart which I hope reproduces OK, the gold price retraced the move from the GFC low of $700 to $1920, initially briefly to the 50%($1320) level before the plunge to the 61.8% level ($1180 support) before a relief rally, to $1440, which failed below the 38.2% confirming a bearish dead cat bounce, and then rapidly fell through the 50% retracement support level (bearish) and is now hovering above the 61.8% level - on a bearish looking chart, so if this level gives way , then technically the 78% retracement level ($970) will come into view. To say that $1000 is a critical level is such and understatement ! If theis gives way then $850 and $700 are the next major support areas. For those new to technical analysis, these Fibonacci Retracement levels are eerily predictive of where stocks are likely to retrace to, and this can be seen on chart after chart . So, ask your self after you've updated your gold history and gold bug theories, what's going to be the stimulus to create a new bull market ? Will major powers ever allow a gold backed currency - it would abolish all manifestations of QE, and will miners ever be able to get costs of production under control ?? My answers are none, no and no. I do not think we have to have the advent of a Gold-backed currency to hasten the return to Gold as a safe haven asset. Current production costs should not sway the price of Gold given that almost every ounce ever mined is sitting out there somewhere... i.e. it's really about the stock, and how much of it flows, vs. the flow of new stuff. The only case where production costs do matter is when all current Gold is in strong hands (I think this is true) and most new demand is being satiated with new mined Gold (probably true)... so what is this saying? Seems bullish to me. You are trying very hard to create a construct for yourself that justifies your selling Gold. You have every right to sell your Gold, or any other asset class you feel uncomfortable with.... I just have to argue against the construct you are creating because I don't see it having any validity. Getting folks like us to sell our Gold is exactly what the goal of the price smash scheme has been all along. Perhaps you did not Macleod's article, because in it are all the answers to your points. The stimulus is purely fundamental, there is no available metal to satisfy non-allocated accounts. Anyone can look at the very public ratio of COMEX open interest to eligible metal held by its clearing members - It is 66 to one, up from 25 to one 6 months ago. There is not enough to settle right now, unless other sellers step in. Do you really think there is an unlimited pit of gold after reflecting on the points made here? Your scenario is possible only if governments impose absolute bans on gold ownership, like in 1934. Is that the message of market, that they are coming? So Jim (Sinclair!) is an interesting guy. He says a whole lot of things I agree with, but then he engages in some pretty astonishing hyperbole to describe the various outcomes that to my mind end up muddying the waters. For instance, Jim has talked for a long time about "QE to Infinity." Infinity is a really really big number, it sounds - almost infinite. But when you get down to cases, Jim believes that QE will stop when the USDX drops to 70 - from its current spot at 80.30, or about a 15% drop. Infinity = 15%. But I have to say, I think this position is reasonable: QE stops when the dollar starts to actually crack. But if you just heard the comment "QE to Infinity" I bet you wouldn't imagine it stopping after a 15% drop in the buck. Jim also talks about "US hyperinflation." What does he really mean? Well In Jim's world, hyperinflation happens when the USDX drops to 56, or about a 30% drop in your purchasing power. In the rest of the world, hyperinflation is defined as a rate of inflation of 50% per month. Definitely, there are scenarios where USD drops by 30% but unless that happens every 3 weeks, its not hyperinflation! That's one big issue I have with Jim Sinclair, all the hyperbole. His underlying positions are often reasonable, but the words he uses to communicate his position mean something entirely different to the rest of the world. One area where I have a conceptual difference of opinion with him is on the issues of bail-ins. I certainly agree with the scenario as a possibility and in fact its a likely outcome of the eurozone mess and all the mark-to-fantasy that is going on right now. The whole mark-to-fantasy-and-hope strategy depends on a return of growth to bail out the banks over time. So this whole crisis in europe will continue to drag on until some bright person figures out that growth won't come along this time to rescue the situation. And at that point, all that bad debt will finally get resolved - and the bail-in is the current strategy of choice to resolve them. So my question is, are bail-ins inflationary? Lets see. If a whole lot of bank deposits vanish into a black whole as loans are written down, the amount of money out there ... decreases. Money & credit decreasing...whats that again? Its deflation! What's more, will normal people run out and borrow money, open new businesses, when a bunch of cash they thought they had vanishes? I'm guessing - no. Capital will hide rather than come out to play when it is seized. This will cause contraction of activity, the bigger the bail-ins, the more contraction will occur. Does that sound like a recipe for inflation? It doesn't to me. Right now the eurozone is in a clear deflationary cycle. Draghi is talking about how "inflation will be low" but properly translated what he really means is "oh crap, we're in this deflationary cycle driven by the debt-bubble pop, and I'm out of tools to fix it." Unless there is some massive amount of printing-magic over there (Hello Germany, I know you want to sign up for money printing! ), it all ends in bail-ins, which effectively transfers all the losses from the mark-to-fantasy loans to the depositors and bondholders. Deposits & bonds vanishing = deflation. In addition, capital flows out of the eurozone will increase, since money will flee the prospect of a continuing series of bail-ins. Money will run to places such as the US, which of course will drive UP the USDX. How do we get "Sinclair Hyperinflation" out of a rising USD? And if there is a bunch of money printing in the eurozone to resolve the bad debt issues instead of using bail-ins, money will (most likely) leave the eurozone - for the US - once again driving the price of the USD up. Not to mention Germany will likely leave the zone, again causing more capital fight. Here's the key. Capital flight happens in either scenario, I believe. And the movement of capital is what drives exchange rates. The Eurozone resolution process will end up being dollar-positive, at least for a period of time anyways. We have our own banking issues here, but the ones in europe are much worse. And I've always maintained that europe will most likely have its crisis before we have ours. So mainly I think there are a lot of steps between now, and "the demise of the dollar" and some of the steps may involve significant moves upward in USD before it eventually has its Really Bad Day and we get our Sinclair Hyperinflation. Once the eurozone situation is resolved...then I think Jim gets his time in the sun. Gold $3200? Quite possible, especially if/when we get Sinclair Hyperinflation. Gold $50,000 would take Actual Hyperinflation, which I just don't see as likely. Who regards Jim Sinclair as a renowned expert ? This guy who missed the gold smash down and bear market, who has been predicting hyperinflation forever, despite not getting any endorsement from credible, real experts ?? Jim Puplava et al, are predicting a strong US$, extended low interest rates and deflation - I wonder who is more likely to be correct - Jim P whose calls have been correct or Jim S, a discredited Cassandra who more resembles a broken clock - he may be right someday but when ?? Even gold bug MIsh Shedlock is a strong US$ and deflation exponent. Mish has been very very quite about gold lately, especially gold stocks -- he had a lot of pain in his voice the last time he mentioned it in the "totally unscripted Off the Cuff" -LOL . Puplava wisely points out that gold's bull market rise was from a low oversold base, in a period of rapid economic, credit and wealth expansion - currently we have contraction and wealth destruction - especially in the BRICS, and this is not good for gold ! - he remains bearish on the short term prospects for gold as he can see no stimulus - such as hyperinflation or a weakening US$ etc ! The idea of Saudi Arabia acting like Iran & Venezuela and getting subject to "sanctions" by the IOUSA led financial oligopoly and having their intelligence access and military cooperation and support withdrawn is ludicrous - NOT going to happen ! Also, are they going to shoot themselves in the foot by devaluing their massive investments in US bonds and stocks and real estate ?? Are they going to risk being destabilised ?? NOT GOING TO HAPPEN ! The Saudi's are one of the bulwarks of the status quo, and are an integral part of the IOUSA hegemony in the Middle East, being allies of Israel in opposing Iran and Syria -- yes I know they are the main supporter of radical Islam but that's another story - the ruling class support for Islam is to safe guard their own positions of gross inequality of wealth. What currency will the oil producers use ? Yen - yes, they can settle in Yen to buy Japanese goods & services - ditto Chinese Yuan and the Euro. But the US$ will remain the main international reserve currency, as Venezuela has conceded by virtue of Gold for US$ swap it negotiated recently with Goldman Sachs --- and the recent deal with Iran had a sub clause where Iran agreed NOT to settle trade with gold. So, if using gold for trade is banned by TPTB, then who cares whether there is real or imagined shortages? When individuals demand their gold from bullion banks, if they don't have it they will settle with cash, as ABN Amro did not so long ago. So who cares if there's a shortage of gold ? - nobody that matters. Asian buying will fall off, if the gold price rises too much, because they are now in a deflationary mindset - they will stop buying when prices rise and wait for the inevitable bargain prices - how long will this scenario last - GOK. Why are there so many Jims ? In Australia we call the Jim Willies of the world "ratbags" or "raving loonies" - his latest LOL pronouncement is that rather then QEasing, he's predicting a "tripling of QE" in 2014, and consequently gold is going to the moon = LOL. Obviously the Central American heat & humidity has caused another brain malfunction at 'conspiracy central' - remember that old Wall St proverb " never confuse bull market success with brains (true intelligence & wisdom). Gold is drifting, becalmed, and appears to headed for the rocks - gold fundamentals be dammed! - will it crash or be saved by GOK? In 1966 President Johnson was visiting Australia , to shore up the Vietnam war coalition , but the Labor opposition leader, who was 'anti Vietnam' (in contrast to the PM Harold Holt who famously declared he was "all the way with LBJ") - remarked in a speech at a dinner in honor of LBJ, that the Democratic and Republican parties had been likened to 2 empty bottles with different labels - what's changed ? With mid term elections due in 2014 and Presidential elections in 2016, neither party is going to risk rocking the boat before 2017. The Republicans mainstream realise that the hard line debt ceiling strategy has been an unmitigated disaster, and their pragmatic center will adopt the current paradigm - QE/ZIRP/'acceptable growth of government debt and of course negative ads, character assassination etc ---- till the IOUSA and Japan are indistinguishable ! So where's the stimulus for gold coming from in the short to medium term ? - buggered if I know. Moi. You might want to take a little stroll down the path of studying bloodlines ... you know, those things that make the royal families who they are and explain why they have their wealth. After all, Queen Elizabeth doesn't work on the side at Mickey D's flipping burgers to keep herself in pocket change. Jim Sinclair's father was Bert Seligman. I might behoove you to research the House of Seligman and its connection to the House of Rothschild. Jim Sinclair's mother was a Sinclair (St. Clare) of the Merovingian bloodline. Look at the connections of those bloodlines to money and power. They go back a long, long way. That connection is why I'll wouldn't discount him. How about your sources? Better connections than him? More experience than him? I'll take wisdom over flippancy any day of the week. It's still early in the game my friend.